Sometimes, when I go to my Taiwanese friend's place to cook, he usually bake a dessert which involves the use of bananas. In the past, he made banana chocolate chip bread, moist and healthy banana muffin and strawberry banana muffins. Recently, he bought the full collection of Food Made Fast by Williams-Sonoma. These cookbooks seem to "break the routine" of buying a cookbook, try out a few recipes and put it back in the shelf. The recipes are quick and simple to follow and the results come out great. We would highly recommend it. 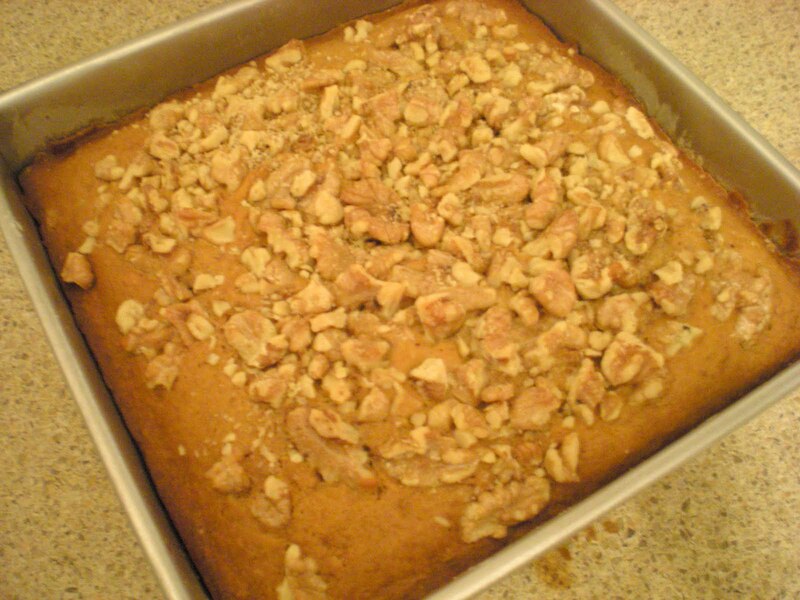 This cake recipe is taking out from Food Made Fast: Baking. The cake turns out moist along with the crunch of walnuts and with a satisfying amount of sweetness. Try it out and you will see. 1. Preheat oven to 350F. Butter a 8-inch square pan. Sprinkle with flour and tap off excess. 2. 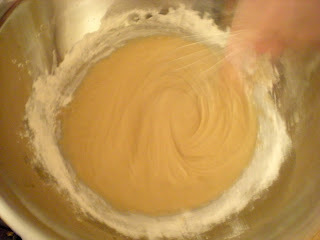 In large bowl, mix together flour, baking powder, baking soda, cinnamon and salt. 3. In another bowl, beat together the butter and sugar until creamy. Add eggs and honey, beat until smooth. 4. Combine half of the dry ingredients to the creamy mixture, beat until smooth. Afterwards, mix in the mashed bananas. Finally, blend in the remaining dry ingredients. 5. 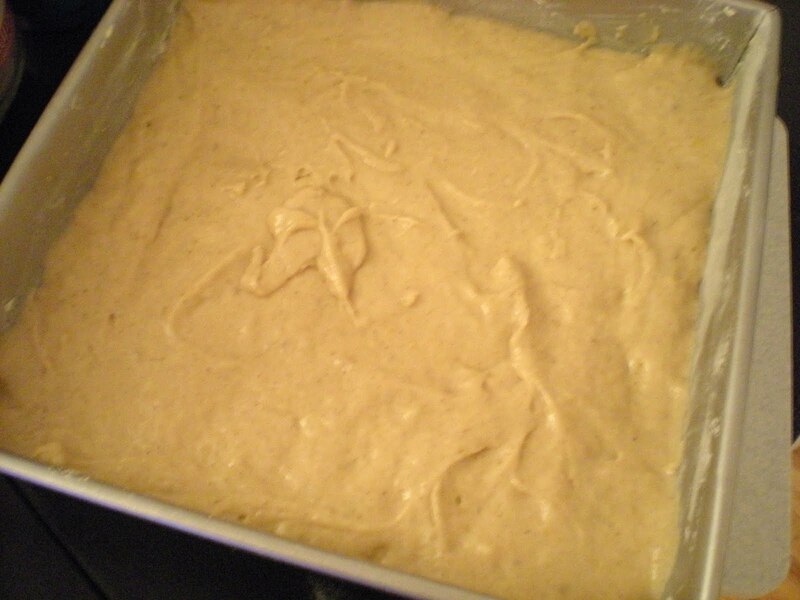 Spread batter evenly in the baking pan. Sprinkle with chopped walnuts. 6. Bake for 35 mins or until it passes the toothpick test. Cool completely. Serve. What filling do you put in your frittata? 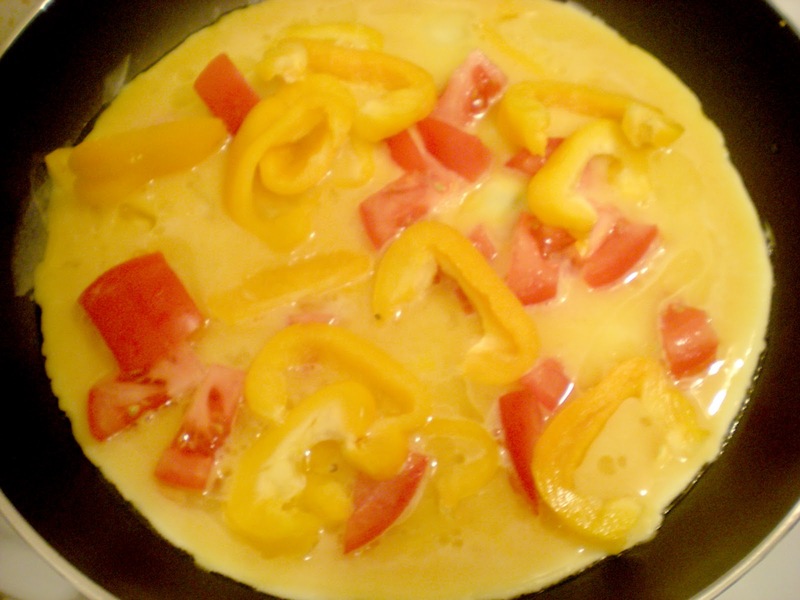 While writing this post, I never thought of asking myself the difference between a frittata and an omelet. The difference is very small. 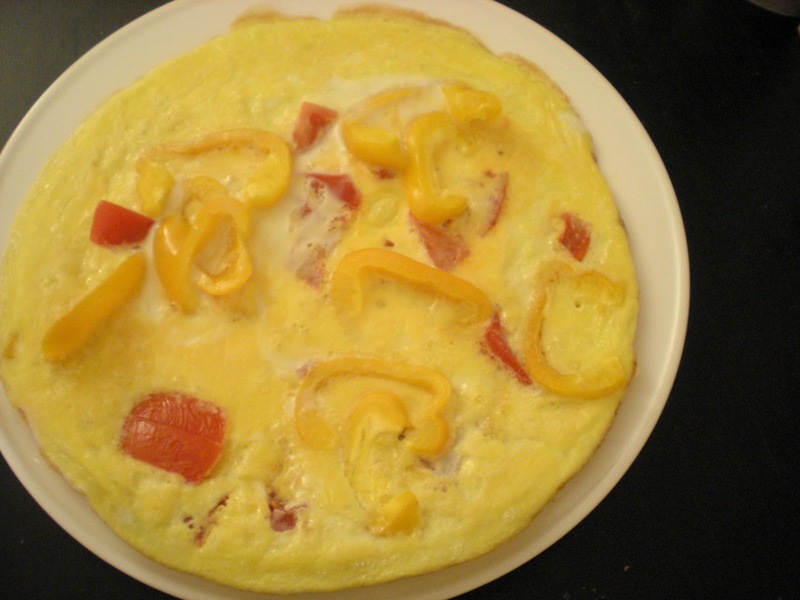 An omelet is usually thin and ingredients are placed on top. As for frittata, the ingredients are cooked along with egg mixture. 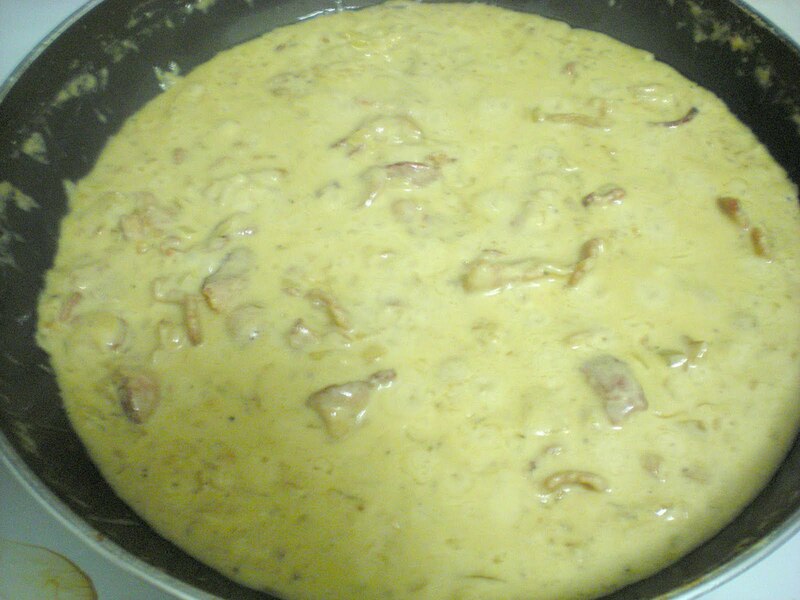 It has been more than a year since my last made frittata which is the mini prosciutto frittata. This time, leftover ingredients are used to prepare this frittata. Here, the vegetables were cooked at the same time as the egg mixture. You can also cook the vegetables first then pour in the egg mix. Personalize it to your own taste! 1. Beat eggs until frothy. Season with salt and pepper. 2. In a large skillet, heat oil over medium heat. Pour beaten eggs into skillet. Let eggs set for 2-3 mins. Add bell peppers and tomato. 3. Let the frittata set entirely. Loosen frittata from skillet and slide it onto a plate. Serve hot or at room temperature. What is your favorite ravioli filling? Since my purchase of the pasta machine, I have been making taglatielle and spaghetti pasta. 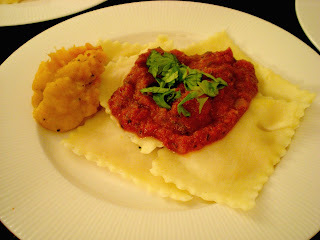 I went a step further and attempt making raviolis using acorn squash as a filling. It took me about an hour to get the hang of putting the right amount of filling and seal it carefully. It is not as bad as I thought and I was amazed of the final result. 1. 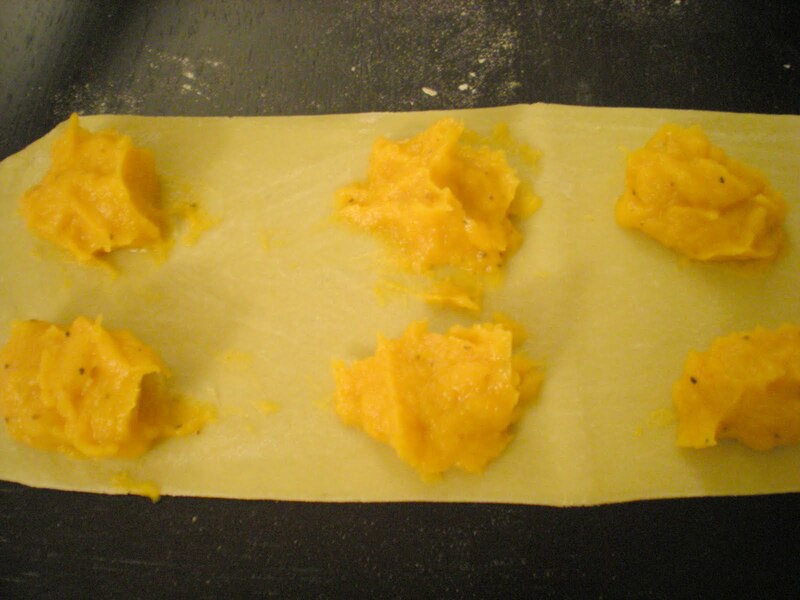 Roll out the pasta dough into pasta sheets. For raviolis, make the sheets a bit thicker than usual, about the same thickness as a nickel coin. Let it dry. 2. Meanwhile, in a large skillet, heat oil and melt butter over medium-high heat. 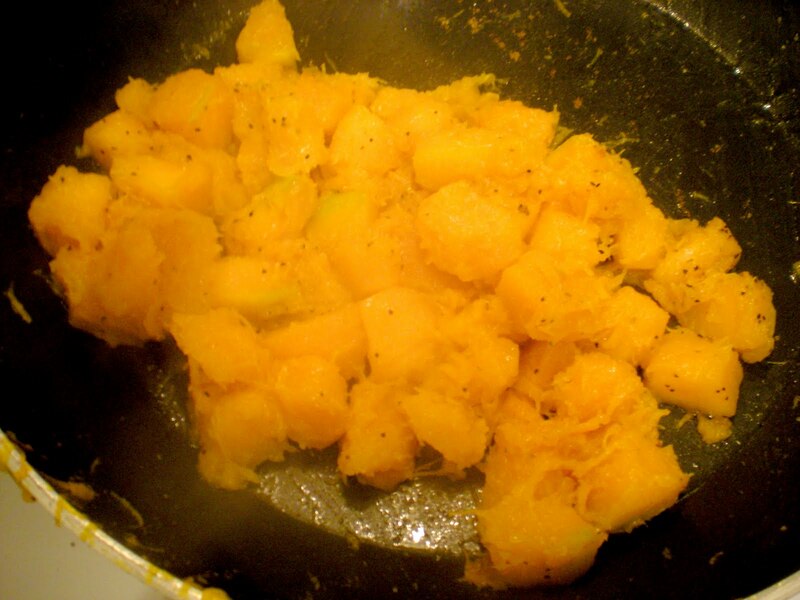 Cook squash until soft. Season with salt and pepper. Add nutmeg. 3. 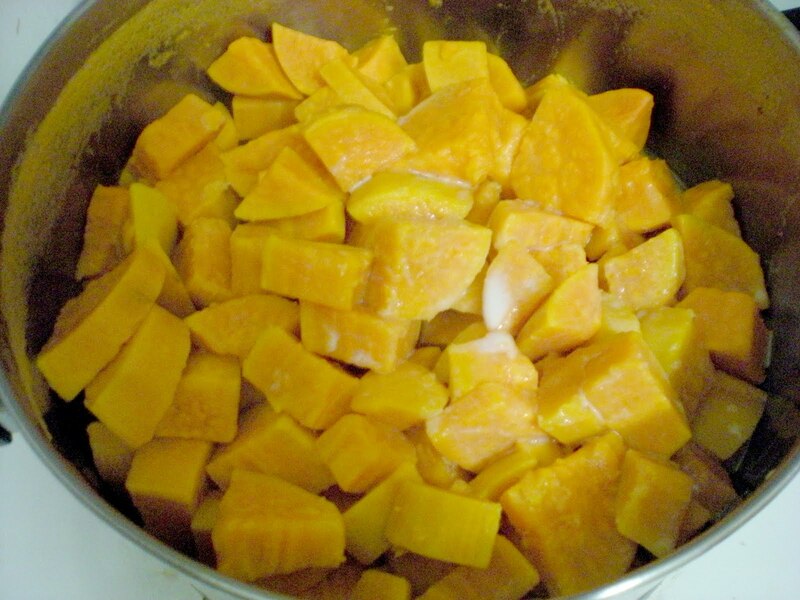 Purée squash with a hand mixer or blender. 4. 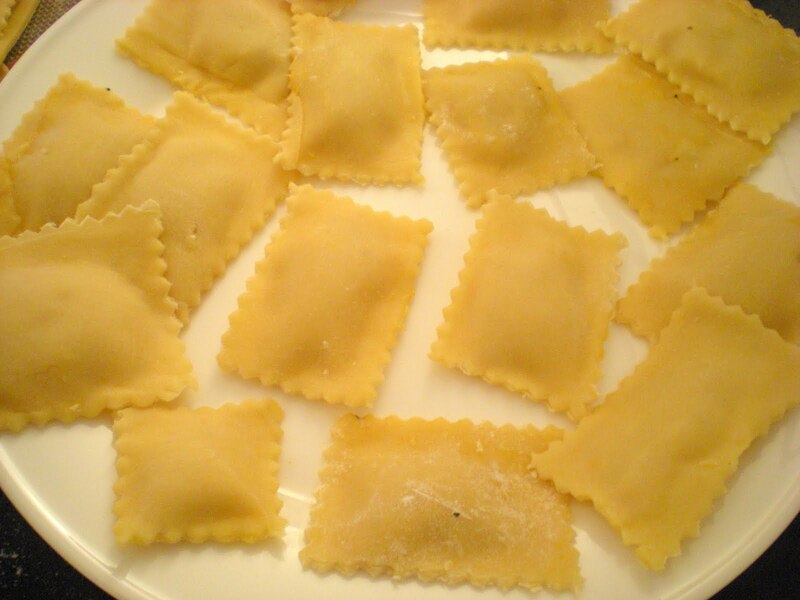 To assemble raviolis, prepare a floured surface. Lay out pasta sheet. 5. 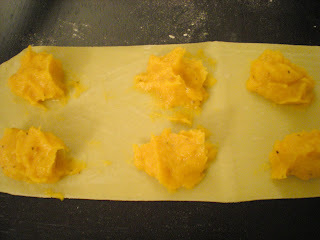 Place teaspoons of purée on the pasta sheet, spaced about one-inch apart. 6. Brush beaten egg on pasta sheet between the mounds of purée. Cover with another sheet of pasta. 7. 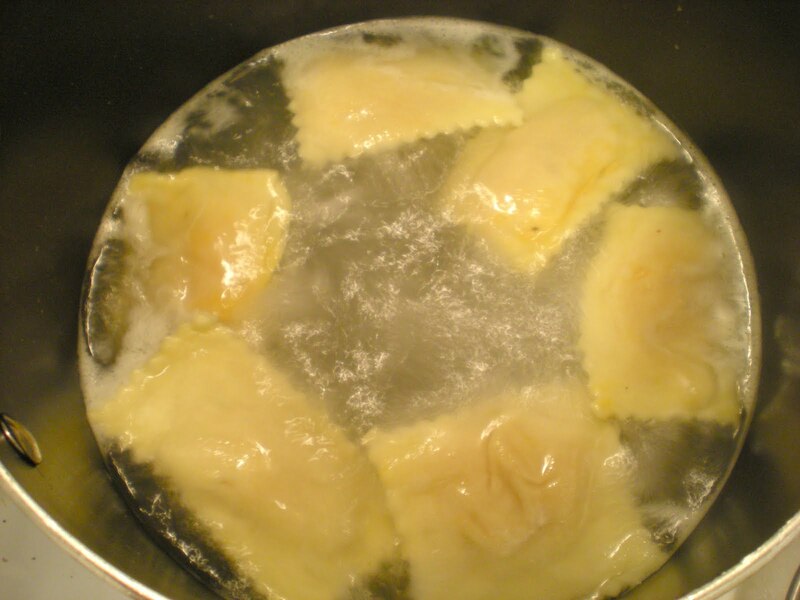 Use a pasta cutter or knife to cut raviolis apart. 8. Bring a pot of salted water to a boil, add raviolis, and cook for about 5 mins. 9. Drain with a colander and serve with your favorite pasta sauce. If you have some purée remaining, serve it as a side dish. The main dish presented with sweet mashed potatoes is tartiflette. 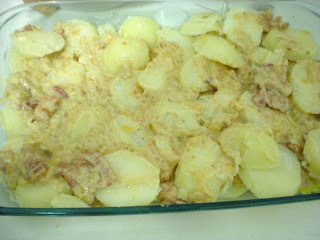 For those who don't know, think of it like a casserole with lots of potatoes, onions, bacon, cream and a dash of white wine, topped with an entire wheel of rich and creamy cheese flowing onto the potatoes. This cheese known as reblochon has similar texture as brie but with strong and fragrant flavors. 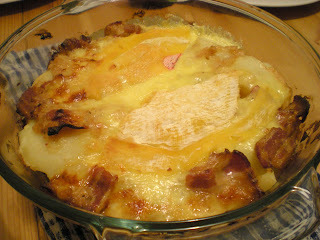 Here is the official recipe for tartiflette. 2. In a large pot, boil potatoes in salted water, about 20 mins. Drain and let it cool. Slice potatoes. 3. Meanwhile, heat skillet over medium heat. Cook bacon until soft and slightly brown. Add in onions and cook until transparent. 4. Turn heat up to high. Add in white wine and let it all evaporated. 5. Turn heat down to medium. Add in cream and stir until smooth. 6. 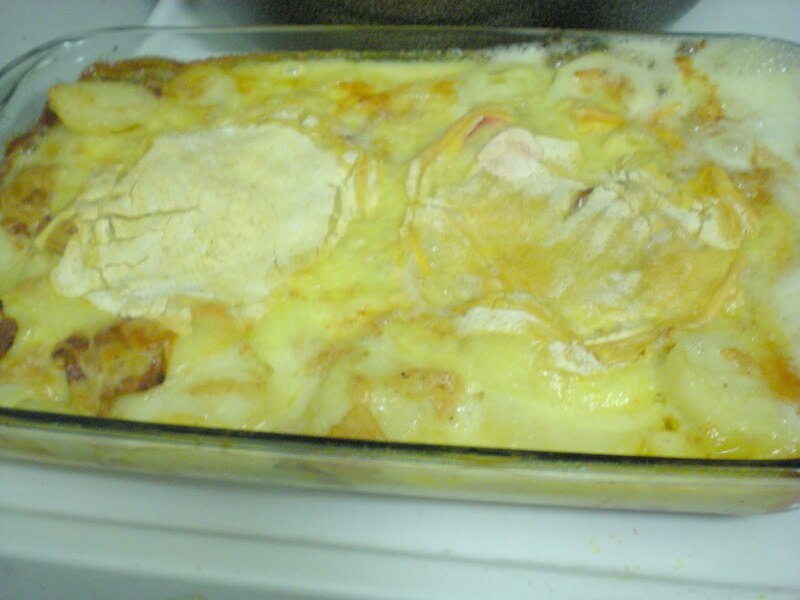 In a 13'' x 9'' baking pan, place a layer of potatoes at the bottom, pour half of the sauce on the potatoes. Repeat this process again. 7. Cut cheese in half lengthwise. 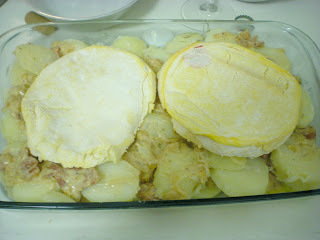 Place the cheese skin-side out on top of the potato mix so that it covers most of the surface. 8. Bake for 30 minutes. Serve. What twist do you add to a regular mashed potatoes? This week, we had our cooking session at my Australian friend's place. His place has a large pantry of Indian spices so I wanted to make a dish with a twist of Indian flavors. 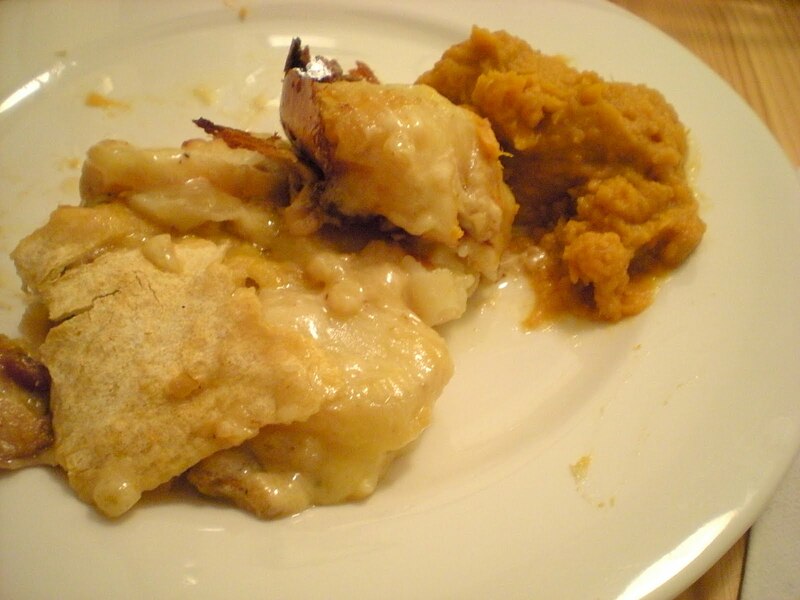 A great healthy side dish is mashed sweet potatoes which go well with any rich and creamy main dish. I love dishes that every bite tastes something different, this is one of them which consists of a blend of vanilla, cinnamon, cardamon and cayenne pepper. The main dish shown in the presentation picture will be my next recipe. Can you figure it out? Here's a hint: it is a French comfort dish from the Savoie region which involves using reblochon cheese. 1. 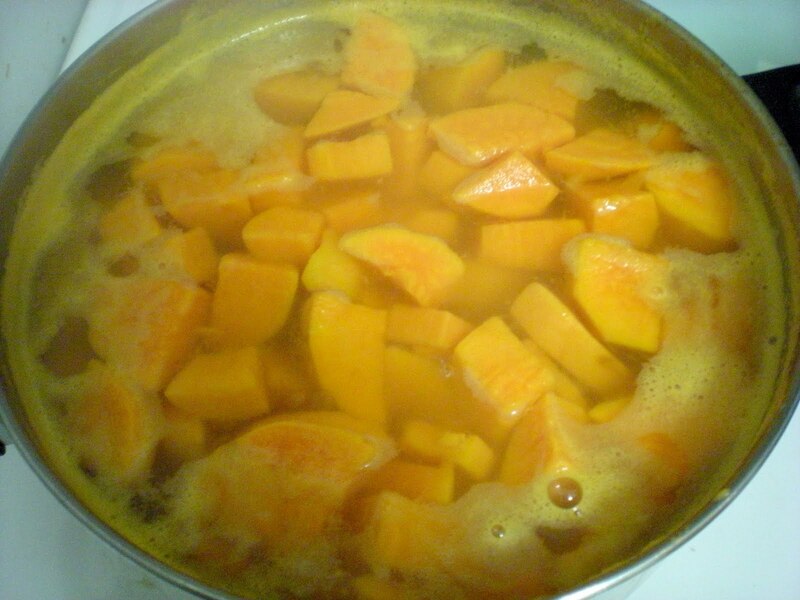 Place sweet potatoes in a large pot. Fill it up with enough water and add about 1 tbsp of salt. Boil potatoes until tender. 2. Drain, and bring back potatoes to pot. Turn heat to low until most of the water is evaporated. Add butter, milk, vanilla and honey to potatoes. Mash potatoes until all ingredients are well mixed. 3. 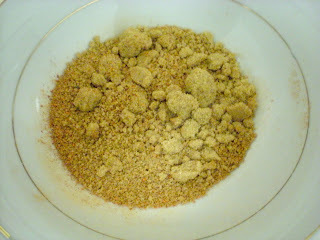 In a small bowl, combine brown sugar, cinnamon, cardamon and cayenne pepper. 4. Add sugar mix to potatoes until incorporated and smooth. Add salt to taste. Serve. 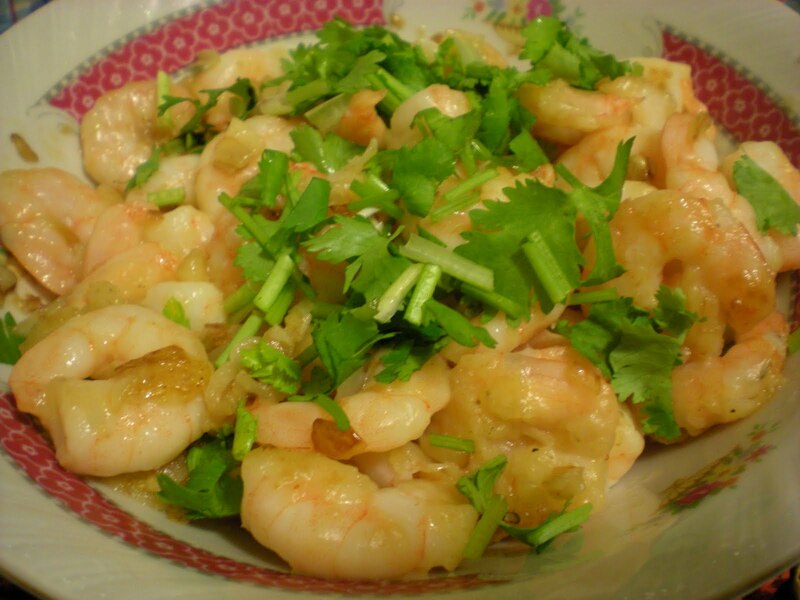 Do you have a favorite shrimp dish? For the past few days, we have very cold weather in Montreal and felt like winter is coming soon. I didn't felt like going to grocery, instead tried to cook something out of ingredients we had at home. My parents tends to buy boxes of shrimps when they are on special, we probably have like a dozen of it at home. 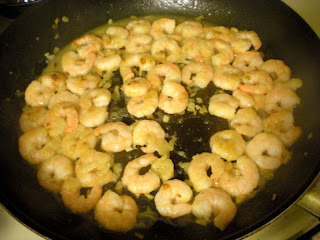 I ended up making a simple garlic lemon-flavored shrimps reduced in rice wine vinegar for the sauce and serve it over rice. 1. In a skillet, heat oil and melt butter over medium heat. 2. Cook shrimp until it turns pink, about 1 min on each side. Add garlic and cook until fragrant. 3. Turn to high heat. 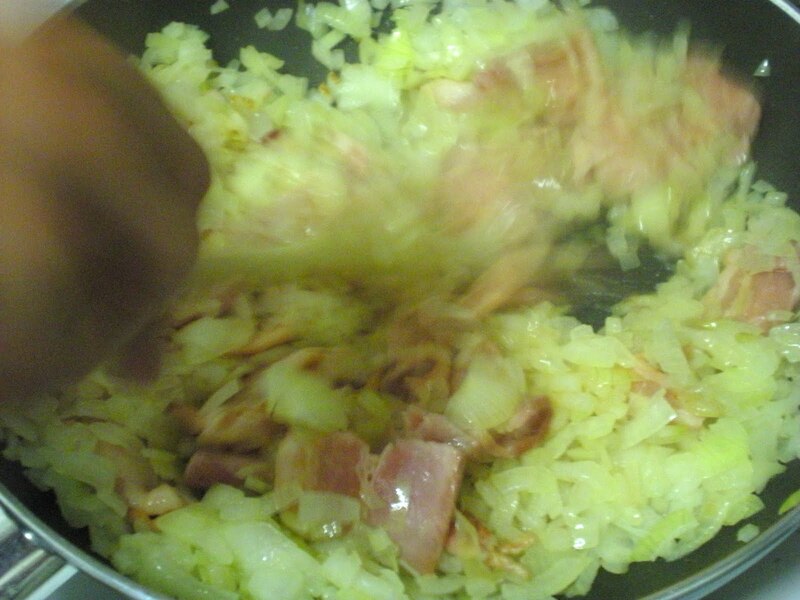 Add lemon juice and wine, cook until liquid reduced by half, about 1 min. 4. Remove from heat. Season with salt and pepper. Garnish with parsley. Serve. Great news everyone! I just submit my Master thesis after a full summer of writing. Back to the food blogging world. 2. 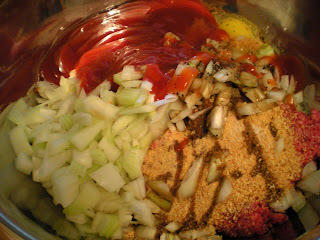 In large bowl, mix with your hands all the ingredients until combined, but set aside the 3 tbsp ketchup. 3. Transfer meat to an oiled bread loaf pan. 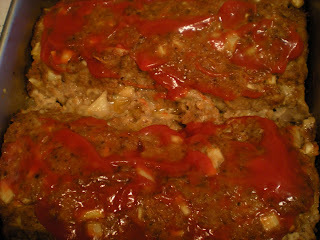 Bake the meatloaf for 45 mins. Spread the remaining ketchup on top of the meatloaf and bake for 15 mins or until the meat thermometer registers 165F inside the meatloaf. 4. 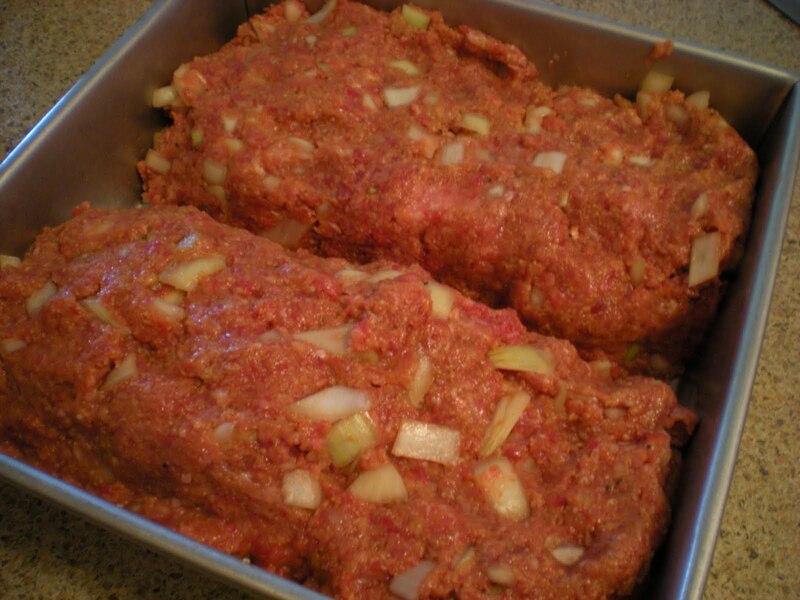 Remove from oven, let it rest for 5 mins. Serve.